Wes Clark, the Prince Albert Food Bank’s Executive Director, is passionate about land reclamation and he’s not afraid of a challenge. With help from the community, he’s turning an abandoned piece of land, almost a brownfield, into a demonstration garden that promotes healing and food security. Wes and his co-workers settled on the old Molson Brewery site, next door to SHARE (Self-Help and Recreational Education). Having a next-door neighbour would be a huge advantage as there would be storage space and people to keep an eye on the site. However, the soil was very poor and would be hard to work as a brick storage facility had been torn down and simply buried. Back to Your Roots Soil Solutions generously donated supplies and tested the soil. The land was safe for food production but contained below optimal macro nutrients resulting in low fertility. Wes wasn’t discouraged. “We’re a food bank,” he said. “We’re used to challenges,” and began enriching the soil with everything from calcium and phosphates to fish oil and compost tea. Seeds don’t germinate well in the poor soil, so the garden takes advantage of leftover bedding plants from local greenhouses. There were some successes. The garden’s magnesium-rich soil doesn’t work well for most plants, but tomatoes thrive in it, producing a bumper crop of super-sweet tomatoes. The Prince Albert Food Coalition was concerned about food waste and curious to find out what quantity of fruit and vegetables were being thrown out by local grocery stores. Lake Country Co-op offered to sort and collect its fruit and vegetable waste for pickup by the Food Bank. It was a generous offer as it is easier and, at $67/ton, cheaper, to simply cart everything off to the landfill. The plan was to turn the waste into compost to enrich the garden, but they quickly reached capacity in their bins as the grocery store produced 4 tons of fruit and vegetable waste in just 3 months. 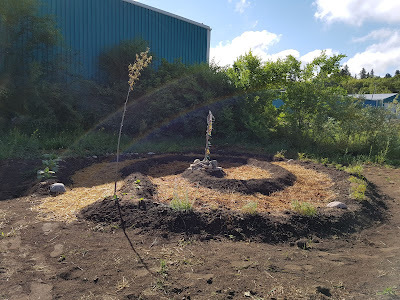 Wes started trench composting; Amy and Aron McInnes demonstrated hugelkultur; and the Prince Albert Parkland Permaculture Guild demonstrated sheet permaculture. A tractor, obtained at the end of the 2017 season, should lighten the task this summer. Education and community involvement were key features of the garden from the start. From local police officers who helped plant the 2017 garden to U of S nursing students who organized a Pumpkin Trebuchet Composting Event, the Food Bank has been able to count on local support. 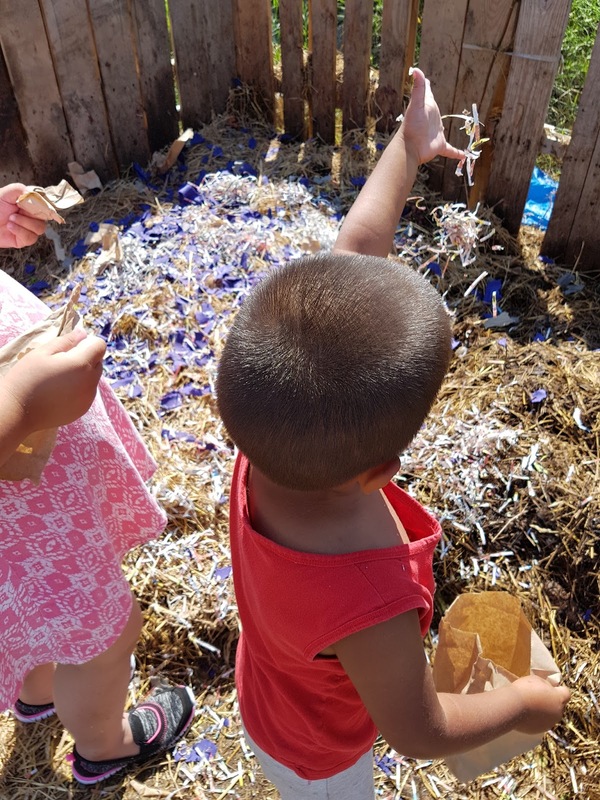 Workshops on composting, container planting, and hugelkultur were well received, while 242 local children were involved in the daily children’s program. Shelley Essaunce has been offering children’s program in Prince Albert’s west end for many years so her involvement was key in bringing local children into the garden for daily activities. This coming summer, the Food Bank hopes to hire an early childhood educator to work with the younger children, providing greater capacity to offer garden-related activities for the older children. The Food Bank’s First Nations partners were concerned about the loss of culture in the urban environment. With financial support from the Prince Albert Community Foundation, elders and educators provided plant-based cultural programming. The Kistapinanihk program established a medicine wheel garden incorporating tobacco, sage, and cedar and offered 9 workshops. Prayer ties, talking sticks, and creative writing were particularly popular. Food security encompasses both food production and consumption. The Prince Albert Food Bank hopes to integrate both aspects by establishing a full-time paid position shared with the Prince Albert Community Kitchen. During the summer, the focus will be on the garden, while in the winter the coordinator will offer school cooking programs. Using food as a unifying force, the Prince Albert Food Bank is healing the land and healing the people.